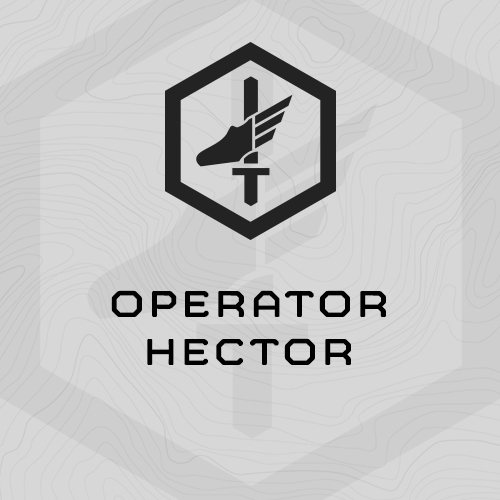 Hector represents the most recent evolution of our day to day programming for operators and military athletes. This is a balanced, 7-Week, 5 day/week training plan which concurrently trains strength, work capacity, military endurance (running, ruck running), chassis integrity (functional core), and tactical agility in relatively equal proportions. Week 7 in the plan is a taper/unload week. This is Version 2 of Hector, Updated March 2017. Hector deploys MTI’s “TLU” Strength progression. Each strength session, you’ll train a total body, lower body, and upper body exercise. Hector deploys multi-modal work capacity events over three different durations: (1) 5-minute event, short rest, then another 5-minute event; (2) 10-minute event, and (3) 20-minute event. ART and Low Back circuits are deployed in Hector. You’ll train at least one of each type each week. Each ART Circuit deploys an Anti-Rotation, Rotation, and Total Body core strength exercise. Each Low Back Circuit deploys three individual low back exercises. Trained once per week during Hector. Three different tactical agility drills are deployed, both unloaded and loaded. Trained two ways: (1) 3-Mile Ruck Run assessment with follow-on 1-mile hard, fast, intervals, and; (2) 4-5 mile unloaded running at a moderate pace. Endurance is trained twice per week. (1) Ruck Run 3 Miles for time @ 45# Ruck plus 10 pounds dumbbell, sledge hammer or rubber rifle. 8x Box Jumps @ 20"
60 Second Prone to Sprint, then immediately back to the sandbag getups, etc. No rest in transition between exercises.